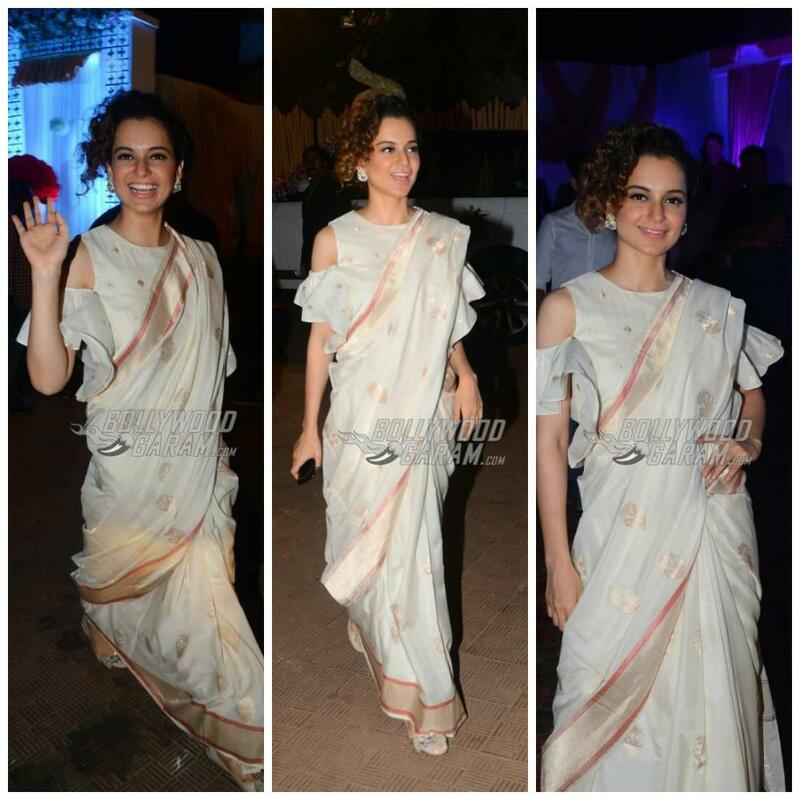 Seems like Kangana Ranaut is in love with sarees. The Queen actress was spotted at the wedding reception of director Vishwas Patil’s daughter in Mumbai on May 9, 2017. Patil is known for directing the movie Rajjo. 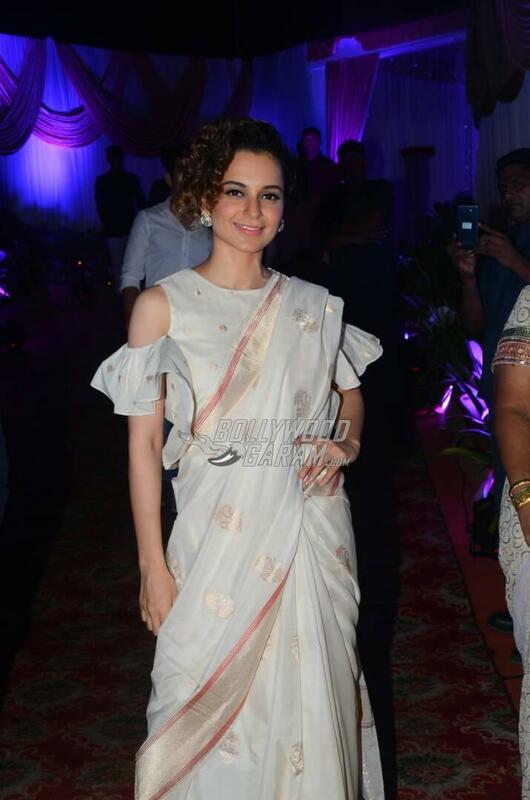 Kangana was seen wearing a traditional white saree with a cold shoulder ruffle blouse. The actress looked stunningly beautiful, was all smiles and also waved for the cameras. She has lately been seen wearing sarees on a lot of occasions. Rajjo, a Vishwas Patil directorial, was a movie which showed an uncanny turn in the life of a prostitue brought by a boy, played by Paras Arora, who is much younger than she is and falls in love with her. Although the movie had a strong script, it did not do well at the box office. 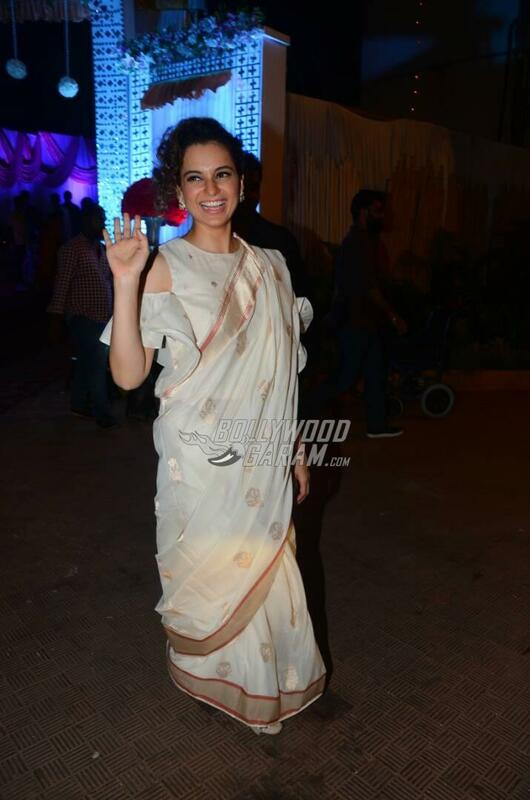 Ranaut has been lately busy and has just wrapped the shoot for the upcoming flick Simran directed by Hansal Mehta. Simran is due to hit the screens on September 15, 2017. She will be seen playing the role of a Gujarati NRI, who gets involved in a crime. The actress is currently filming her upcoming biopic on the historic figure Rani Laxmi Bai, titled Manikarnika: The Queen of Jhansi. 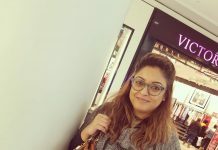 The film is directed by Radha Krishna Jagarlamudi, also known as Krish and is written by KV Vijayendra Prasad, who also happens to be the writer of the screenplay of the Baahubali franchise. Kangana Ranaut, in a recent interview with a leading daily, revealed that this will be her last movie as an actor and that she is ready to take up direction. Ranaut has revealed that she has finalized the script for her directorial venture and it is going to be from the comedy genre. Previous articlePHOTOS - Justin Bieber finally arrives in Mumbai, Beliebers go crazy for him! Next articleSuvigya Sharma paints a life-size portrait of Justin Bieber boxing!